The AGM will be held in the Conference Room, ground floor, of Tudor Rose Court, 35, Fann Street, London EC2. The AGM will be at 2.30pm. Afternoon Tea will then be served. Richard Crowest will be reading a short story by E.F.Benson from Freaks of Mayfair. It is Quack, Quack, where he introduces Mrs. Weston, who is later transformed into Daisy Quantok in Queen Lucia. Richard, who is a member of the Society and well known to members for his readings to us, is a professional reader and script writer and his voice is heard on the Lamb House telephones. We are delighted he can read to us again. Tickets £12.50, through the Society. Details in April’s Newsletter. The Society’s Rye Day will be held on the date above and will include a Buffet Lunch and Tea at Fletcher’s House Tea Rooms in Lion Street, Rye. It will begin 12.30pm for 1pm. In the afternoon there will be a walk round the town looking at places of Benson interest and a visit to Lamb House. 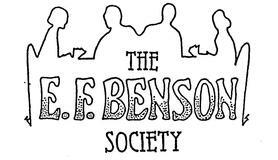 After Tea there will be the Benson Quiz, In the evening we hope to have a reading of a short play by E.F.Benson, written for his friends. Full details in June’s Newsletter. We will meet at Truro Cathedral for a tour of the building, and also the Treasury, where we will see many Benson interest items. E.F.Benson’s father was the first Bishop of Truro and he took up his position in 1876. In the afternoon we will visit the house where the family lived. Their time in Cornwall made a great impression on Fred, Arthur and Maggie Benson, and it is a setting for many of E.F.Benson’s novels and short stories. There will be a Tea and a dinner on the Saturday evening. Those attending make their own arrangements as regards accommodation. Full details in August’s Newsletter.